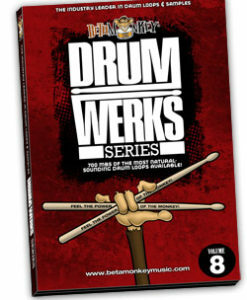 Weighing in at nearly 700MB of live, acoustic drum loops, Drum Werks Volume V is a complete resource for creating your drum tracks. With over 700 loops in 12 different drumming styles, Drum Werks V delivers meaty 75 BPM indie rock grooves, 100 BPM subpop inspired rock grooves, high-energy 150 BPM rock-pop grooves and 180 BPM rock shuffles. With a diverse collection of grooves with a unified drum mix, Drum Werks V will quickly become a staple for use in your drum tracks. With an authentic early grunge vibe, we sought to capture the defining sounds of early Sub Pop records when the drums were honest, raw and in your face. We wanted energetic and aggressive grooves with a bite. Forget the slick production and heavy-handed processing – Drum Werks V gives you live acoustic drum loops, ready to become the drum tracks for your next alt-indie songwriting project. The really cool thing about this disc is that every groove, fill and hit is sonically matched, pristinely recorded off the same kit and taken from the same recording session. This makes for a cohesive library of uniform ambience front to back, where you can mix and match elements from not only within a single folder but also across the entire disc. The smart inclusion of cymbal swells, tom variants and several intricately played hi-hat and ride cymbal patterns (with and without snare backbeats) for each groove genre makes creating a complex and dynamic-sounding arrangement possible. Whether building a contemporary pop track from scratch or looking for brilliant session drumming to remix, Drum Werks V5 is a go-to loop collection for ballsy, realistic results. The real strength of the library is the range of loops provided. As well as the usual one-, two-, and four-bar patterns and their variations, there are some really excellent fills, intros, endings, and breakdowns provided. I’d have no problem using these loops for any style of rock — from nu metal, through grunge, and into more pop-orientated indie styles — but they could also work in funk, blues, and straight pop. The other remarkable thing is the price, particularly as this includes worldwide shipping. Indeed, Beta Monkey also offer various bundles, bringing the price per library down even further. This is an absolute steal — so much, in fact, that I ordered half a dozen more libraries myself! These arrived very promptly and are now being put to good use in my own studio. Excellent value for money and highly recommended. A versatile collection of loops with a complete matching multi-velocity drum and cymbal sample set. A time-tested collection of go-to loops for your drum tracks. Full Range of Rock, Alternative Rock, Grunge and Indie Rock Drum Styles: Songwriters looking for honest and real drums with an indie, garageband ethic and vibe will easily and quickly develop drum tracks with these live acoustic loops. Comprehensive Groove Folders: All grooves organized by style/BPM. Grooves sets include main grooves, variations, and fills. All songwriting elements are grouped in each folder. The Finishing Touches/One Shots: We also included cymbal swells, ending ritards, and more. These one shots are vital to realistic drum tracks and they’re included, unlike many commercial releases. Cohesive Drum Sounds: All loops were recorded in a single recording session (all grooves, fills, etc. are sonically-matched). All grooves, groove variations, fills, and one shots will mix perfectly. A cohesive drum sound expands usability – a trademark Beta Monkey feature. Fully-Sampled Drum and Cymbal Samples: All multi-velocity drum and cymbal samples are included. Use the Drum Werks V samples to build grooves or use them to augment and customize any of the 700 loops. This disc gives you true flexibility. Compatible with Drum Werks VI: Same session, same versatile drum sound. Only the snare voice was changed for Drum Werks VI. 738 (578 MB) original, license-free 16/44 drum loops and samples. Available as 16-bit ACIDized WAV, APPLE LOOPS (AIFF), and REX2 loops. 196 (105 MB) multi-velocity drum and cymbal samples. 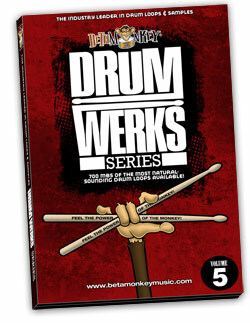 Drum Werks V Review: Read what the press had to say about these loops.